To begin, the only thing appealing about Blackmail is the music and perhaps some action sequences. Other than that, this film has nothing new to offer. We have ACP Rathod (Suniel Shetty) who is happily married to Sanam (Priyanka Chopra). They also have a typical, annoying spoilt child played by Parth Dave. Next, we have Shekhar (Ajay Devgan), who has been rotting in prison over the last years, planning some revenge on ACP Rathod. Shekhar was a former race car driver who would help criminals escape with slick driving. Well, Shekhar feels that the ACP is responsible for his wife, Anjali’s (Diya Mirza) death. Another criminal, played by Mukesh Rishi, knows that Shekhar is about to be released and provides him with help to get rid of ACP Rathod. We see flashbacks of Shekhar’s life, we have the present view of the ACP’s life, and then all hell breaks loose. Shekhar is out of prison and begins communicating with the ACP’s family. Well, there is nothing criminal about this, yet, the cops try everything to catch Shekhar in an illegal activity, with no success. After a few reels, Shekhar finds out that before he went to jail, his wife gave birth to a child and only ACP Rathod knows where this child is. Shekhar decides to kidnap the ACP’s kid in order to know the whereabouts of his own child. The rest of the story is downhill from here. As mentioned, the story has nothing new to offer. There are no thrills or excitement. Suniel Shetty looks like a punk cop just trying to get his way. Ajay Devgan, who I felt was improving over the last few years, failed to impress in this role. Priyanka Chopra hammed through her role and looked odd playing Shetty’s wife. Direction and editing were sloppy, except for the car racing scenes. Music by Himesh Reshmmiya is tuneful, but tends to drag the story along after a while. Lyrics by Sameer are typical. 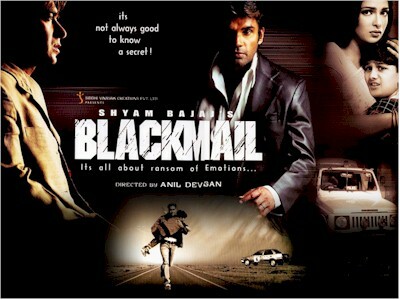 Blackmail is to be watched only if you are a fan of Shetty, Devgan, or Chopra, other than that it is completely not worth it.